Lucretia Mott (1793-1880) was a Quaker minister, abolitionist and social reformer who dedicated her life to the goal of human equality. Mott was a major figure in the reform movements of the nineteenth-century: abolition, women's rights, school and prison reform, temperance, peace and religious tolerance. Lucretia Coffin was born on January 3, 1793 on the island of Nantucket, Massachusetts, the second of eight children born to Thomas and Anna Folger Coffin. At the age of thirteen, Lucretia was sent to the Nine Partners Quaker Boarding School in Millbrook, New York. There she learned of the horrors of slavery from visiting lecturers such as Elias Hicks, a well-known Quaker abolitionist. After graduating Lucretia served as an assistant teacher at Nine Partners from 1808-1810, and during that time the Coffin family moved to Philadelphia, which was to be Lucretia's home for the rest of her life. She was shocked to discover that the male teachers were paid three times as much as the female instructors. One of those teachers was her future husband, James Mott, who became a Quaker leader and merchant. On April 10, 1811, Lucretia Coffin married James Mott at Pine Street Meeting in Philadelphia. James Mott engaged in the cotton and wool trade (later focusing only on wool as a protest against the slavery-dependent cotton industry in the South). Between 1812 and 1828 Mott bore six children, five of whom lived to adulthood. Lucretia Coffin Mott began to speak at Quaker meetings in 1818, and in 1821 she was recognized as a minister in the Society of Friends in Philadelphia. The Quakers enabled women to take public positions on a variety of social problems. Like many Quakers, Mott considered slavery to be evil; she refused to use cotton cloth, cane sugar and other slavery-produced goods. In her sermons, Mott asked others to join the boycott and gained prominence as an abolitionist. She began to make public speeches for abolition, and soon began to travel extensively throughout the Northeast, usually accompanied by her husband who supported her activism throughout their long marriage. Since women were excluded from the formally organized abolitionist groups, in 1833 Lucretia Mott and nearly 30 other women organized the Philadelphia Female Anti-Slavery Society. However, many members of the abolitionist movement opposed public activities by women, especially public speaking. Others objected to women speaking to mixed crowds of men and women. Nonetheless, the rising popularity of Quaker sisters Sarah and Angelina Grimke and other women speakers attracted support for abolition. The endless criticism her outspokenness inspired did not deter her from speaking, but as her fame spread she suffered increasingly from dyspepsia (an abdominal ailment). Yet she continued her work for abolition. She managed her household budget to include hospitality to guests and donations to charities, and was praised for her ability to maintain her household while contributing to the cause. In the words of one editor, "She is proof that it is possible for a woman to widen her sphere without deserting it." At the Anti-Slavery Convention of American Women in Philadelphia in 1838, a mob destroyed Pennsylvania Hall, a newly opened venue built by abolitionists for their meetings. Mott and the other white and black women delegates linked arms to exit the building safely through the crowd. Afterward, the mob targeted Mott's home and Black institutions and neighborhoods in Philadelphia. As a friend redirected the mob, Mott waited in her parlor, willing to face her opponents. Lucretia Mott never shied from controversy. In June 1840 the Motts attended the World's Anti-Slavery Convention in London, England. Lucretia was one of six American women delegates, but the male delegates voted to exclude the women from participating and required them to sit in a segregated area. Elizabeth Cady Stanton attended the convention with her new husband, a delegate from New York, while on their honeymoon. As Lucretia Mott and Elizabeth Cady Stanton wended their way arm in arm down Great Queen Street that night, reviewing the exciting scenes of the day, they agreed to hold a women's rights convention on their return to America, as the men to whom they had just listened had manifested their great need of some education on that question. Thus a missionary work for the emancipation of woman... was then and there inaugurated. Encouraged by debates in England and Scotland, Mott returned with new energy for the anti-slavery cause in the United States. She continued an active public speaking schedule in major Northern cities, and traveled to slave-owning states, giving speeches in Maryland and Virginia, where she met with slave owners to discuss the morality of slavery. In the District of Columbia, she had a personal audience with President John Tyler, who was impressed with her speech. It was not until 1848 that Lucretia Mott and Elizabeth Cady Stanton and others could organize the First Women's Rights Convention in Seneca Falls, New York. The Declaration of Sentiments, written primarily by Stanton and Mott, was a deliberate parallel to the Declaration of Independence: "We hold these truths to be self-evident, that all men and women are created equal." Mott presided over the convention and was the first to sign the Declaration. Women's rights activists advocated a range of issues, including women's suffrage (the right to vote), equality in marriage, such as women's property rights and rights to their earnings. At that time it was difficult to obtain divorce, and fathers were always granted custody of children. Stanton sought to make divorce easier to obtain and to safeguard women's access to their children. Though some early feminists disagreed, Mott stated "her great faith in Elizabeth Stanton's quick instinct & clear insight in all appertaining to women's rights." In 1850, Mott published her speech Discourse on Woman, a pamphlet about restrictions on women in the United States. Throughout the turbulent 1850s, Mott continued her speaking and engaged in further antislavery and non-resistant activities. She worked with other antislavery leaders such as Frederick Douglass, William Lloyd Garrison and Lucy Stone. In 1857 Lucretia Mott and her family moved from Philadelphia to a farm in Cheltenham, Pennsylvania, known as Roadside, a three-story stone building with an ivy-covered porch where Mott lived for the rest of her life. Roadside was not as hectic as their house in Philadelphia had been, but it became a stopping place for a different kind of traveler - a station on the Underground Railroad. However brief their pause at Roadside, fugitive slaves found the comfort and reassurance they needed to continue their journey to Canada and freedom. This activity continued until the slaves of the southern states were granted their freedom under the Emancipation Proclamation on January 1, 1863, which Lucretia Mott described as "a day of jubilee," but she knew that the work of securing equality for all Americans was far from over. James Mott died in 1868. Despite her sorrow, the next year Lucretia chaired the annual meeting of the American Equal Rights Association, an organization formed to achieve equality for African Americans and for women. Dismayed over the irreconcilable conflict concerning the Fourteenth Amendment, in 1869 Mott joined with Stanton and Susan B. Anthony to form the National Woman Suffrage Association, devoted to creating a federal amendment granting women the vote. Also in 1869 Mott was active in the plans for the opening of a Quaker institute of higher learning, Swarthmore College. Despite increasing frailty, Mott continued to travel, speak and contribute her energies to a variety of causes. For years she was vice president of the Universal Peace Union. In 1870 she was elected president of the Pennsylvania Peace Society, an office she held until her death. In 1876, the centennial of the Declaration of Independence, she presided on the Fourth of July at the National Woman Suffrage Association convention in Philadelphia. In her 85th year she delivered her last public address at at the Thirtieth Anniversary of the Seneca Falls Women's Rights Convention, on the appropriateness of placing women in positions of equal power. 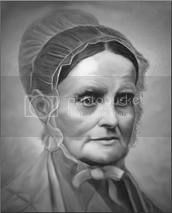 Lucretia Mott died on November 11, 1880 of pneumonia at her home, Roadside, surrounded by her remaining children and grandchildren. She was buried in the Quaker Fairhill Burial Ground in North Philadelphia. She is commemorated in a sculpture by Adelaide Johnson at the United States Capitol, unveiled in 1921. In a true marriage relation the independence of the husband and the wife is equal, their dependence mutual, and their obligations reciprocal.